As gardeners, we’re most thankful for the soaking rains. Remember last year when new plants went into freezes with bone-dry roots? And, as Austin gardeners entered the season of wastewater averaging, we were hesitant to water, yet anxious if we didn’t. I’m thankful we’re spared that dilemma this year. With the rain and cooler temperatures, my firespike (Odontonema stricta) in the shady patio cove bloomed at last. This leafy perennial (joined by some gingers) gets the briefest glance at early morning sun. In the hottest part of summer, it likes some extra water, but generally did fine with a weekly dose in its shady, heavy soil spot. Its first location got a brief bit of afternoon sun and it wilted daily. Since I moved it, it’s been pretty carefree. It can freeze to the ground, and can be slow to return (though it does return). Last year it didn’t freeze in its protected spot next to the house. Right now it’s leggy since it recently shot up. I won’t prune it now, but I’ll shape it next spring to encourage a bushy shape. I’m not one to baby plants too much. I’m open to experiments, but if success means too much work, or if I can’t find a move that suits the plant (often a move is all it needs), it gets moved out of here. I’m thankful that I’ve come to recognize what works for my site and for me. That’s John Wilson’s philosophy, too. As our featured gardener this week, see how he and his wife Debra Leff exchanged front yard grass for a neighborhood living room. John wanted to exemplify the resourceful lessons he teaches his biology students at St. Stephen’s Episcopal School. He also wanted to apply the tough-plant lessons he’d learned while taking them on expeditions to the Davis Mountains and Big Bend. 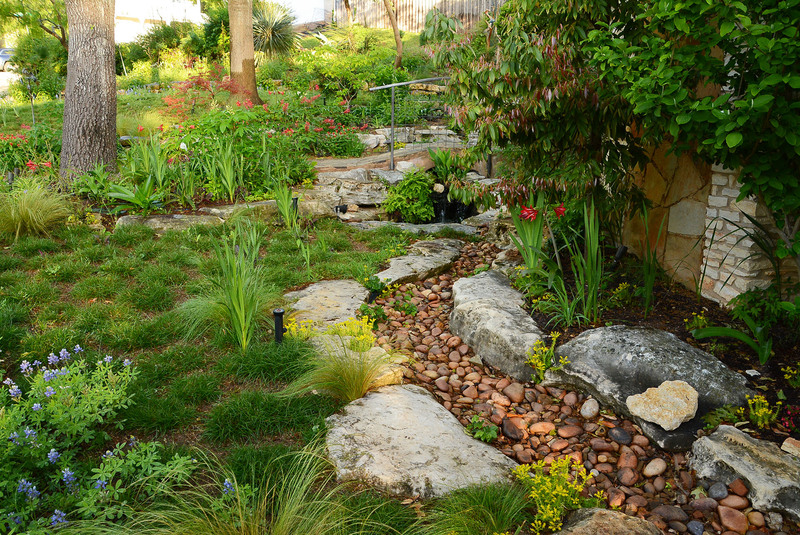 Recognized as an Austin Green Garden, it’s become more than that. Neighbors stop by to visit the pond and check out what’s changing in the garden. Then they follow the concrete-stained pathway to come sit and talk awhile. Keeping to our tough plant theme, we also take a look at small native trees and shrubs that attract wildlife and stand up to drought. Jared Pyka from Native Texas Nursery meets with Tom to give you a few outstanding ideas, like this Arroyo sweetwood (Myrospermum sousanum). Jared’s list includes choices for gardeners in confined spaces, or as accents and living screens in larger gardens. Of course, you can get the entire list on our fabulous new website! (Note: Native Texas is wholesale only, so please ask for these great plants at your favorite nursery). It’s always Thanksgiving weekend when I plant a few more bulbs. This year, I’m adding some Erlicheer and Grand Primo. Recently, Lauren Ogden told me that if we plant too early in our usually warm early fall days, the bulbs can send up foliage before their roots get established. This can be harmful if we get a killer freeze. Two weeks ago, I did move some bulbs that were hidden under the silver germander that grew so fast. They had good root systems and are looking good. We’ll see if they bloom this spring. Sometimes you simply must experiment! I thank you all for sharing this year with me! ← CTG’s new website is up!